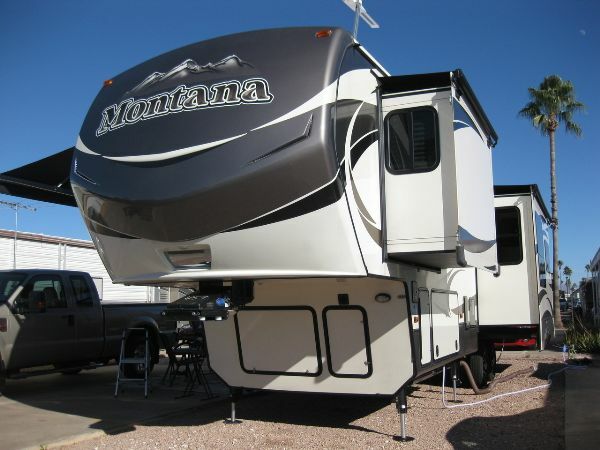 2013 KEYSTONE MONTANA 3400RL - REDUCED!!! EXTENDED MANUFACTURER WARRANTY ON EVERYTHING - GOOD THROUGH JANUARY 2017. LOADED WITH FEATURES: Pushbutton AUTOMATIC LEVELERS with six-point hydraulic powered system. INTERIOR: CHERRY Hardwood Cabinetry throughout, HUGE 4 door 12 cu ft Fridge with extra storage drawer below the refrigerator. Over the range convection/microwave oven with range hood. 70/30 stainless steel kitchen sink. Fantastic Vent-Fan in Kitchen. High arch pull out kitchen faucet. Royal Entourage Corian countertops and backsplash. Flush mounted Corian range covers, Large Pantry, SONY LCD FLAT TV and FM/DVD/CD Surround Sound System in Living Room. Fireplace that also is a heater, Pre-wired for Satellite TV, Digital TV Antenna with Booster. 15,000 BTU Dometic Quiet Zone air conditioner. Prewired for 2nd AC. Bedroom: 32" HD LCD TV. Two Leather HEATED MASSAGE RECLLINERS with ottomans. Queen sized bed with an upgraded to COMFORTABLE residential mattress. Washer/Dryer prep, Queen size Air Hide-a-bed Sofa, Free Standing Dinette with leaf extension and 4 chairs. Glass, neo-angular shower with sky dome, Deluxe porcelain toilet. Built-in cabinet clothes hamper in closet. LED recessed interior lighting throughout, Elegant crown molding above bedroom cabinets, Day/Night shades throughout. Hand laid mullion cabinet doors in living area & bedroom Hand laid mullion bedroom closet doors, Slide Wide Open bedroom closet w/LED track lighting. Cedar lined storage under bed w/hidden storage area Nice bedroom dresser & armoire. Bedroom cell phone charging station in cabnitry with residential wood blinds.. EXTERIOR: High Gloss Gel-Coat Fiberglass Exterior, Pushbutton Automatic Levelers with six point hydraulic powered system. 19' Electric Awning. Slide covers on all four slides. Aluminum Wheels, Central exterior water and convenience center. Black tank flush. 4 Season Arctic Insulation Package, Vented attic system, Mor/ryde Hitch Pin and suspension, Hitching light and mirror. Spare Tire, Dexter E-Z Lube axels with self adjusting brakes. HUGE lower Storage Compartment with Access from Both Sides. Bedroom TV is portable for viewing outdoors using provided power and signal sources. Frameless dark tint safety glass windows, Max Turn front end cap w/dual LED light bars & hitch vision. IMMACULATE CONDITION: NO smoking, no pets, NO wear, EVERYTHING works and is SHOWROOM NEW. Delivery can be arranged to any state based on mileage. FREE delivery to some locations Price reduced!!!. $45,900.00. Phone: 513-405-2772.